VideoCodec (Staging Test) is known to be an advertising-supported application. Specialists have found out that it installs add-ons on Internet Explorer and Mozilla Firefox. It seems that this adware is not compatible with Google Chrome at the time of writing; however, there is, of course, a possibility that this program will be updated. If you have already detected this extension, we highly recommend that you hurry to remove VideoCodec (Staging Test) because it is a useless program that has been developed to generate money for the publisher. It is very likely that the publisher receives money every time you click on some kind of advertisement. We do not think that you want to help the creator of this untrustworthy program. Besides, it is known that this advertising-supported application provides users with advertisements that are not very trustworthy and can cause harm. Our specialists say that it is very important to remove VideoCodec (Staging Test) as soon as possible because this program will keep bombarding your screen with various ads. 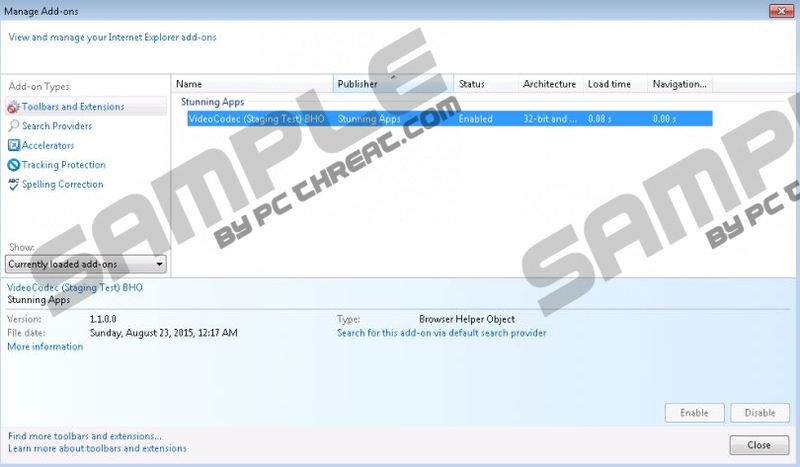 It has been found that this application shows pop-ups, coupons, and banners mainly. In addition, you might be offered to download some kind of program on your computer. We do not recommend installing the offered software because you might install an untrustworthy program instead of a useful application. Actually, researchers at pcthreat.com think that you should ignore all the ads generated by this program because they might expose you to threats. Of course, this adware program might provide you with harmless advertisements too, but it is very likely that you will cause harm to your system eventually if you click on every ad that appears to you. VideoCodec (Staging Test) not only shows ads, but might also connect collect details about your browsing habits in order to provide you with relevant ads. Of course, you can put an end to this. Researchers have also noticed that VideoCodec (Staging Test) might be somehow associated with Browser Guardian, which is another adware program. What is more, this program can slither onto your computer without your permission. In this sense, this adware does not differ from previously published adware programs. Unfortunately, there are hundreds of other undesirable applications that can sneak onto your PC without your consent too and it is not so easy to block the way for them. According to our researchers, the easiest way to protect the system from malicious software is to install a security tool. If you acquire a trustworthy tool, it will take care of the threats that might attempt to enter your system. Unfortunately, it is impossible to erase VideoCodec (Staging Test) via Control Panel. It means that it is not so easy to erase this adware program; however, it is still possible to do that. We have prepared the manual removal instructions. You can use them or you can delete VideoCodec (Staging Test) automatically. If you decide to use an automatic tool, we suggest that you invest in a really trustworthy tool, such as SpyHunter. You will not regret investing in this security application because it will eliminate all the threats in the blink of an eye and your system will be protected 24/7. Locate the extension associated with VideoCodec (Staging Test). Select the extension that you wish to remove. Enter %PROGRAMFILES(x86)%\VideoCodec (Staging Test) and click OK.
Delete all files and folders of this adware program. Quick & tested solution for VideoCodec (Staging Test) removal.